Design and production of silotrailers for bulk powdery products. 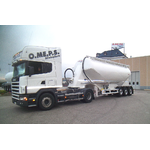 Our tankers are very different to others on the market thanks to a number of world patents that helps to maintain O.ME.P.S’s position as a leader in modern technology. Company is flexible in tailoring its output to different countries' specific needs, legislation and conditions. We work closely with universities and technical research organisations to explore new fields of application for our products and to conceive new software programs with the purpose to improve and speed up the process of computer-aided design. All this serves to give customers absolute quality and extra revenues. Our tankers have a reputation for standing up to the test, they are working in some of the harshest conditions such as is experienced in countries like Russia, the Czech Republic, South America, Australia and certainly African continent. The main advantage of aluminium is found in the tare weight savings, something that transport operators quickly transform into increased payload and extra revenue! We are looking for customers (end users or distributors) from all over the world, who are looking for a good-quality products at excellente price. The fields are: cements plants, flour plants, PVC, chemical plants, transport companies that perform road transport by pressure tankers. Companies interested to become distributors or simply resellers in their countries.